Over the centuries, healers from various cultures have made a note of certain natural plants, fruits and herbs that have a positive effect on human health. Many have documented the specific health benefits that can be derived from their use or ingestion. A good number actually relate to hair that is on the head, brows and eyelashes. With time many people forgot about these remedies and turned to more modern solutions to their hair problems. When it came to eyelashes that have fallen out and thinned, many opted for cosmetic solutions like mascara, false lashes and extensions. In recent years however, people have come to acknowledge the wisdom of their ancestors and taken a greater interest in the range of traditional remedies that exist. This is partially thanks to a growing discontent with chemical based remedies that are now considered by many consumers to be dangerous. Whenever a person considers using one of the many available natural eyelash growth serums, they will pay special attention to the ingredients listed. 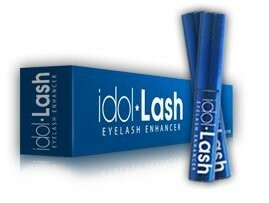 One of the top selling serums, Idol Lash Eyelash Enhancer, is renowned for using concentrated amounts of highly beneficial natural ingredients that some people even have in their kitchens and pantries. The difference between what one however gets with Idol Lash Eyelash Enhancer and a DIY homemade recipe is the concentration of the ingredients. 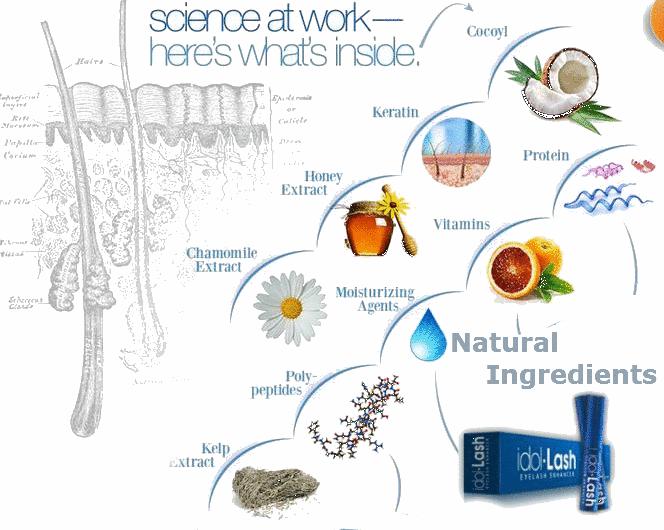 Using proprietary formulas and processes, manufacturers of products like Idol Lash Eyelash Enhancer have been able to squeeze high concentrations of these oils, herbal extracts and acids into each tube of product. This makes their product more potent than any DIY recipe prepared in the kitchen. Here we will look at the key active ingredients that are included in the Idol Lash Eyelash Enhancer, and how they work on improving on the length, thickness and strength of lashes. Nettle Extract – nettle is a herb that is commonly used in hair loss products. It is believed to help inhibit the action of DHT, a male hormone that has been linked to pattern baldness or alopecia. Its topical application is believed to be highly effective in encouraging new growth of hair where it was lost. It also has anti-inflammatory properties that can help deal with any irritation to the skin. Chamomile extract – chamomile extract is a powerful herbal remedy that is perhaps best known as a tisane or sleep aid. It is often enjoyed as a tea before bedtime. It does however also possess anti-inflammatory and bactericidal properties. This is useful in alleviating irritation and itchiness that is often associated with hair loss. Alfalfa extract – this extract is packed full of several vitamins including vitamins B6, C and K. it also has a high antioxidant level that helps to encourage circulation and combat the damaging effects of free radicals. Vitamin K is useful in boosting blood circulation and the provision of elastin that helps keep skin cells soft. Polypeptides – these are chains of amino acids taken from proteins. They form the building blocks of cells and when added to serums encourage new growth of hair. When a strong growth of hair is promoted, it results in stronger strands that are more difficult to break. When stronger, the eyelashes are also more likely to hold on until they are much longer than normal. Cocoyl sarcosine – extracted from young coconuts, cocoyl sarcosines are modified fatty acids that are made for use in beauty and cosmetic products. These fatty acids work with acyl sarcosinates to improve the appearance and texture of hair. They promote better body and shine of the hair. They are an especially useful ingredient in the treatment of hair that has been damaged physically or by chemical treatments. Keratin – this is a naturally occurring protein that is believed to help in strengthening the hair shaft and making hair more resilient. This action is what allows for eyelashes that are treated with serums that contain keratin to live longer and achieve greater length. They also help to smoothen out the shaft and allows for better shine. You will achieve healthier looking lashes with a keratin infused eyelash growth serum. Sodium Hyaluronate – This is a sodium slat of hyaluronic acid. Hyaluronic acid is a naturally occurring polysaccharide that if found in connective tissue of animals. It acts as a humectant in cosmetic products. This means it helps to hold in moisture. A well hydrated hair shaft or lash smoother and shinier. It is also more flexible and less likely to fall out or break. Sodium hyaluronate is also a good skin-conditioning agent that can improve the health of the eyelid. Collagen amino acid – collagen is a combination of several key amino acids needed to proper hair growth. This includes glycine, proline, alanine and Arginine. It boosts the immune function, helping to reduce hair loss for those who are ill. it also boost blood circulation so more nutrients can get to the hair follicles and stimulate faster and stronger growth of eyelashes. It also inhibits and enzyme linked to the development of male pattern baldness. Jojoba seed oil – extracted from the seeds of the jojoba bush, this oil is very popular in hair and skin cosmetics. Its molecular structure is very close to that of sebum and helps to soothe skin through its antibacterial properties. It is mostly made up of monounsaturated fats that allow it to penetrate into the shaft of hair follicles and strengthen the fibers from inside. It is also a good hair conditioner that helps to add shine and elasticity to lashes. It is also an emollient that fills in cracks in the hair cuticle and repair damage. It also contains a healthy dose of other vitamins including vitamins A, B1, B2, B6 and E.
Bitter orange flower oil – this is a rarer ingredient in cosmetics that comes from the blossom of the bitter orange tree. Also referred to as neroli, this ingredient oil is an expensive option in aromatherapy and is often used to improve on fragrance. In hair growth serums, this ingredient is helpful in conditioning the hair and helping to add shine. It can also help to soothe sensitive skin. Allantoin – this chemical compound is often used as a moisturizing agent and emollient. It smoothes out damaged hair cuticles and make the lashes appear shinier. This can help reduce the risk of breakage and provide hydration that will keep the lashes flexible.